Finding the right Montessori school for your child is never an easy task. There is no copyright or licensing necessary to use the term “Montessori.” Therefore, a school using the term “Montessori” may or may not be engaging in the pedagocial or philosophical practices originally intended by Dr. Maria Montessori. When choosing a Montessori school, there are several key factors to consider. 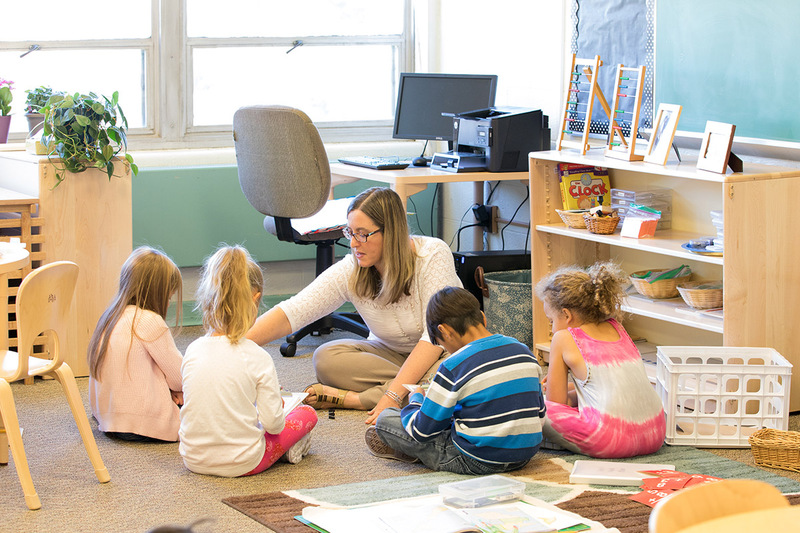 When you enter a Montessori classroom, you should see a warm and inviting environment, where students aren’t sitting in rows of desks but are working individually or in pairs or small groups. The Montessori classroom is organized into curriculum areas, often including practical life, language, mathematics, sensorial materials, science, history, art, music, and movement. A full range of Montessori materials should be available in each environment. Montessori teachers should be certified with a Montessori teaching credential for the age group they teach. Most classrooms also have a Montessori teacher’s assistant. The role of the teacher is to guide, mentor, and deeply understand their students as well as to design an environment that allows for the optimal development of each student in their classroom. A Montessori classroom is composed of mixed age groups, generally spanning a three year age range. This enables older students to act as mentors to younger students, and for younger students to learn from and interact with older ones.